We spent a nice Christmas at my parent's house in Georgia this year. This is actually the same house where I spent most of my high school years, an astonishing fact to me, since we usually moved every three or four years on average growing up. My parents were originally military, and we saw a lot of the country. 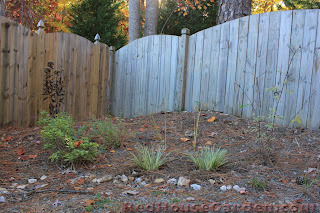 It was here in Georgia where I first met my biggest gardening nemesis - the problematic Red Clay dirt. Part of the yard with the infamous Georgia red clay that is so prominent in the region. 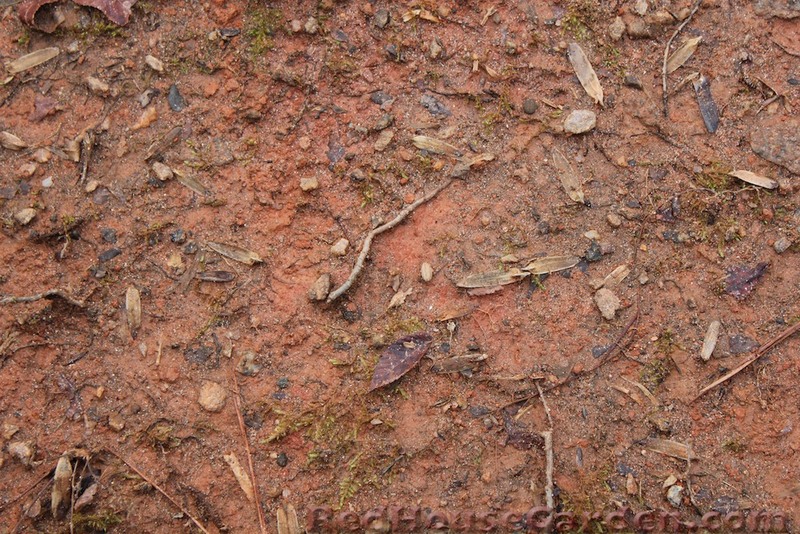 I remember the first time I saw Red Clay dirt. I had moved to Georgia partway through my freshman year of high school, and we were staying with some family friends the first day while my parents were getting our house set up. I remember going out into their clear-cut back yard. 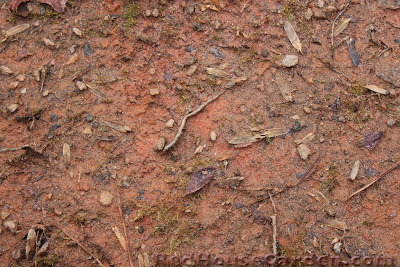 It had rained the previous day, and the yard was a giant field of Unbelievably Red mud. I don't think I had even heard of Red dirt before and was quite taken aback. The red color of the clay is due to iron oxides. That was not the only color surprise of the day, I remember. The previous tenants of the house my parents bought had been rumored to be drug dealers, and it was still decorated in what was no doubt the latest drug dealer style - every single wall had been painted Baby Pink, the carpets were an Indescribable Green, and the vertical window blinds were Shiny Metallic Gold. For our first supper in that house we had Yellow potato bread, which I had never had before. Red dirt, pink walls, green carpet, gold shades, and yellow bread - I felt like I had gone down a very strange sort of rabbit hole. 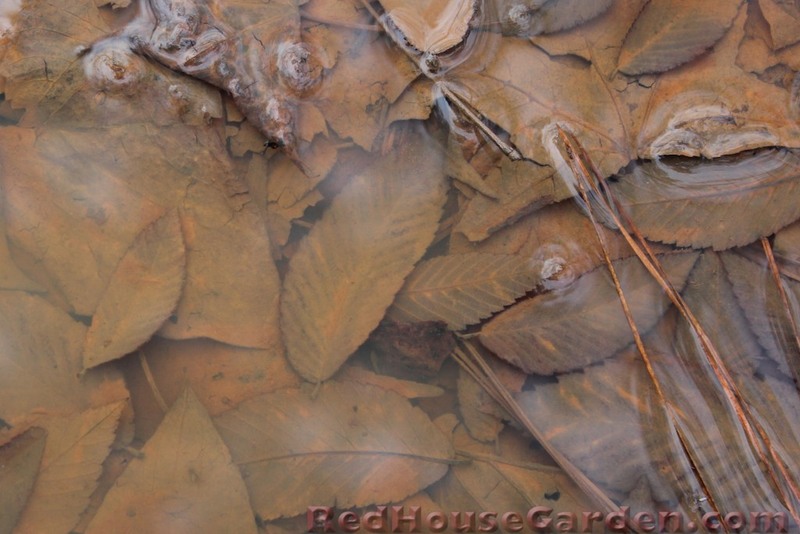 Even the leaves in this puddle are covered with red clay. 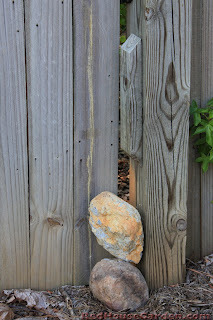 Now, a couple decades later, the house has been redone in much more tasteful colors, and I do like yellow potato bread. However, I haven't quite reconciled with the dense, clumpy, terrible-draining Red Clay dirt, which runs in veins through my North Carolina yard. 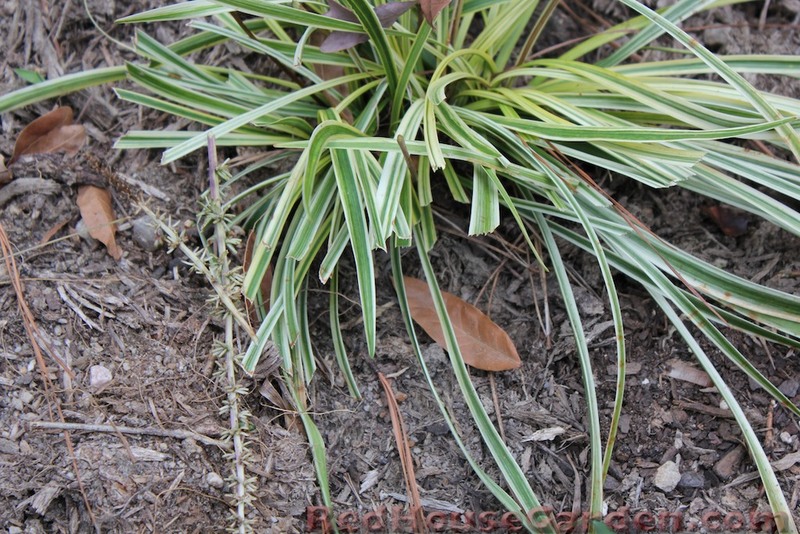 Most plants cannot survive such badly-draining soil. 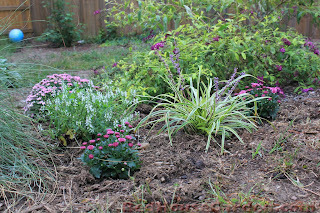 The problem is that in order to garden most effectively with Red Clay dirt, one must first gently cultivate it with a pickaxe tiller backhoe, mix lots of compost and good Brown or Black dirt into it, and then pray that you've pickaxed tilled excavated a large enough area so that you haven't created a swimming pool for your plants. A lot of people with clay give up and just garden in raised beds. Having red clay soil can also lead to problems with erosion. In this spot, the soil around the base of the tree has been washed away over time, exposing some interesting roots. 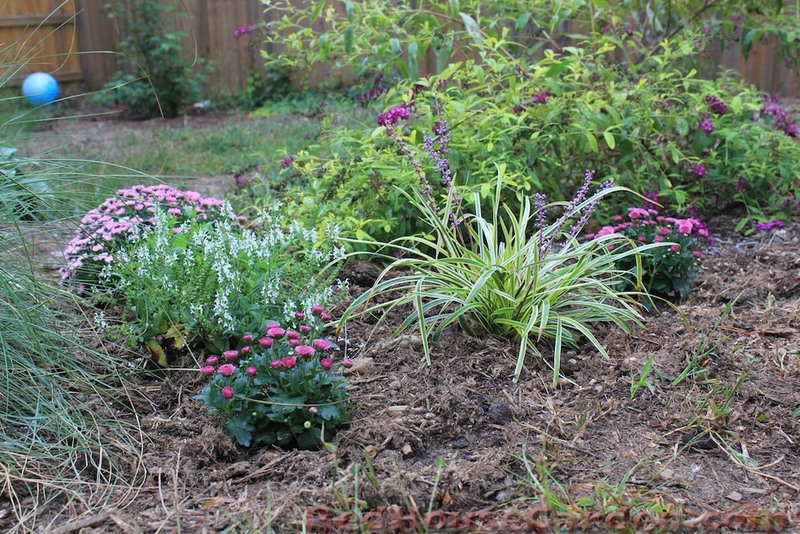 My mom, who likes to garden but has little time between working and her passion of quilting, has chosen a less confrontational approach to her Red Clay and plants mainly no-fuss native plants that can withstand the clay better. 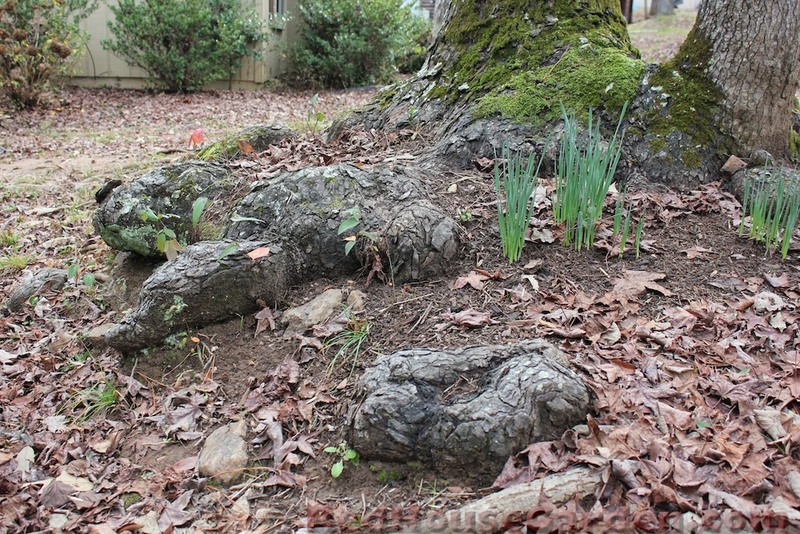 Native dogwoods reside under the giant preexisting Sweetgum trees, and plantings of azaleas, hydrangeas, coreopsis, and daffodils prevail. 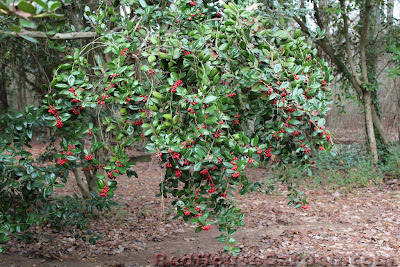 Thankfully there are a few plants that do well in clay, like many hollies. 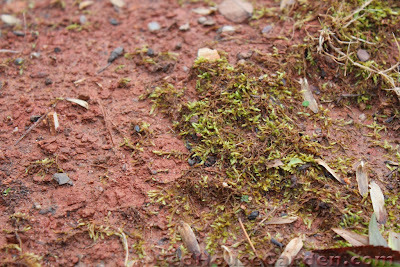 Thankfully I don't have quite as much of the contemptible Red Clay as my mother's garden does. 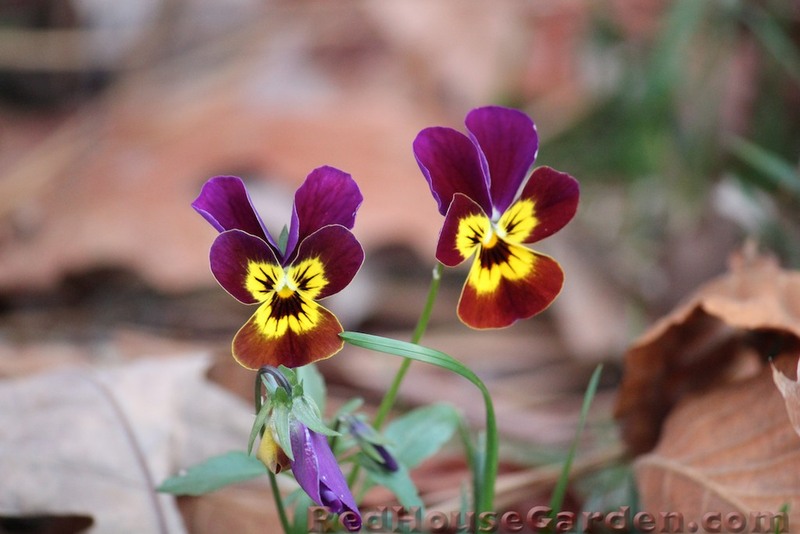 Nevertheless, I have to do a lot of soil amending to grow the plants that I want. Even my 2 year old now eagerly points out the bags of nice Black dirt and compost for me every time we go to the plant store. (Good child!) And when I garden, my trusty pickaxe is never far from hand. 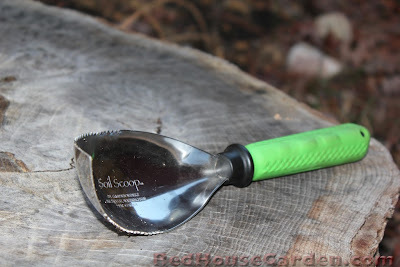 Mr. Red House bought me a new tool to help dig through the clay, which I am excited to try out! 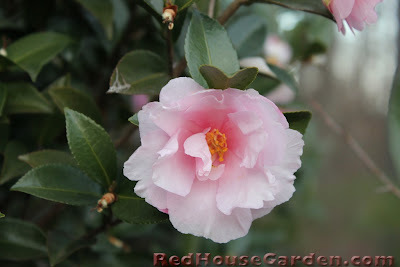 It's December, and the Camellias are in full bloom. 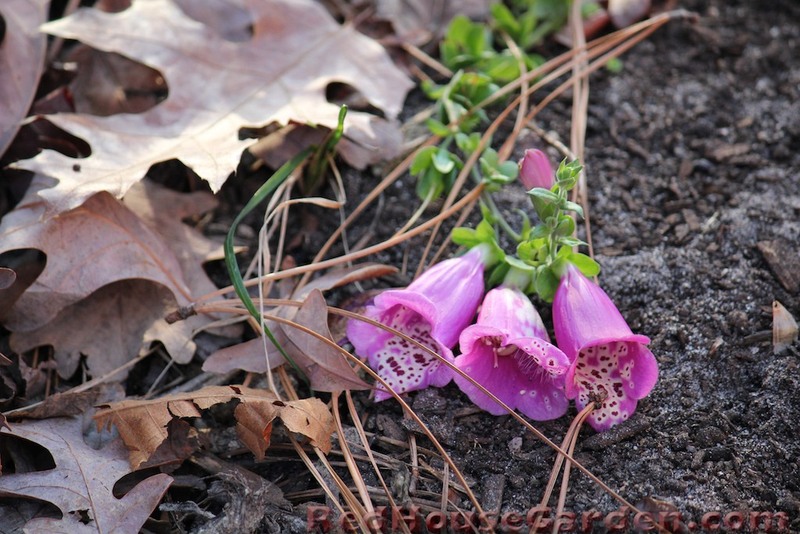 They come in a variety of pink, red, and white and provide food for the bees and other pollinators during these winter months. 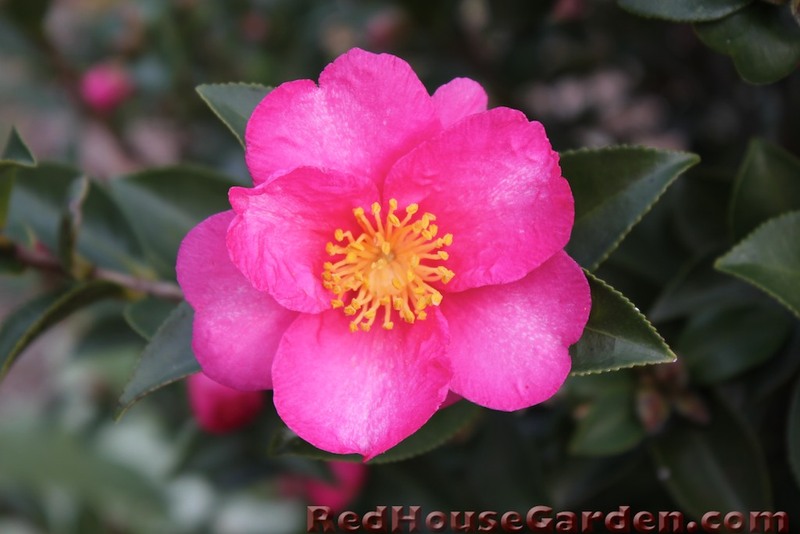 Though beautiful, it does sometimes seem strange to see bushes loaded with pink blooms this time of year. 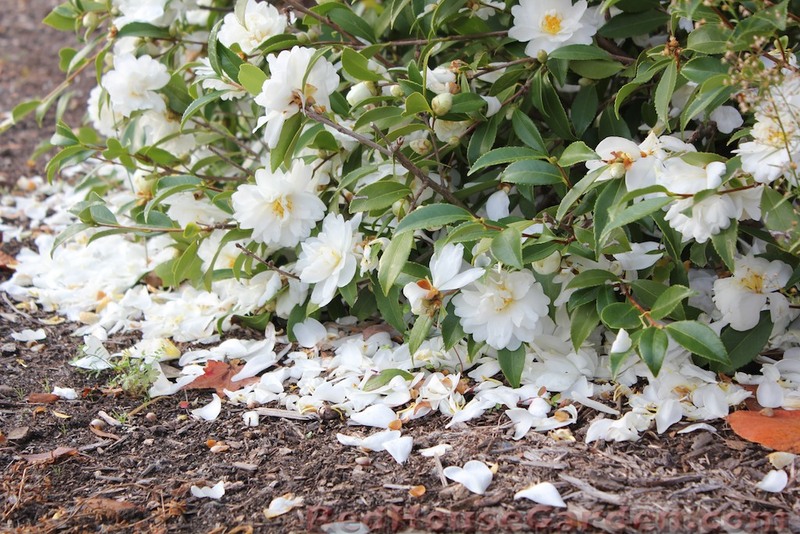 My favorite thing about camellia bushes is the way the ground underneath becomes strewn with flower petals. The camellia bushes look like they are sitting on a soft petaled carpet. I don't have any camellias in the Red House Garden, but since there is nothing blooming here I thought I'd show pictures of these local camellia blooms. What?! Did she just call us NOTHING?! I like that, here we are blooming our little heads off, and she calls us NOTHING? 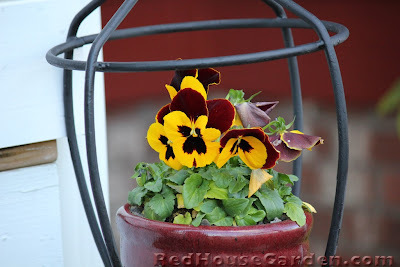 Oh, sorry, apparently I do have pansies blooming here. That's right! 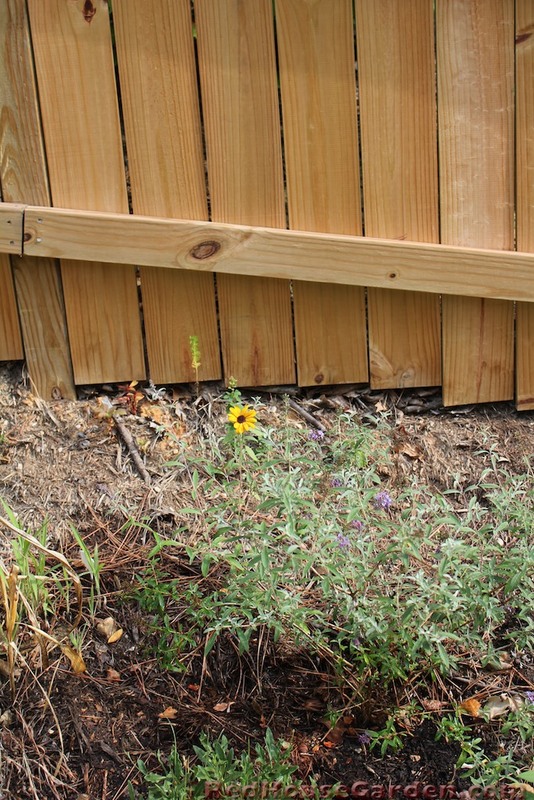 You even have some blooming right up front. 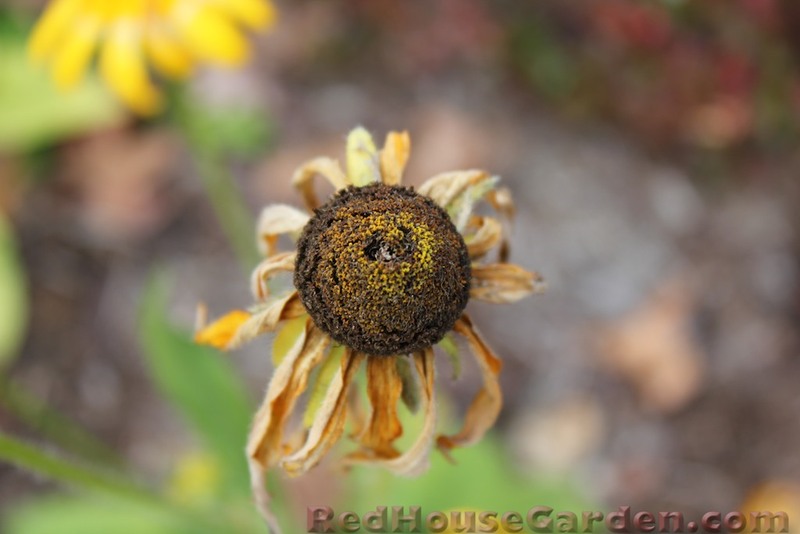 Don't you ever walk around your garden anymore? And neglecting your garden! Haven't you even noticed us miniature hollyhocks?! 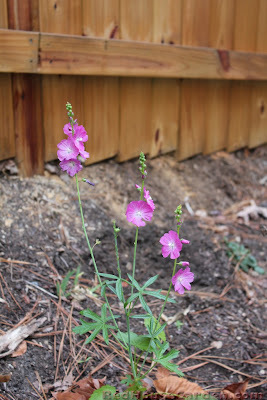 It's our first little blooms, too! Sorry, hollyhocks, you are very beautiful! 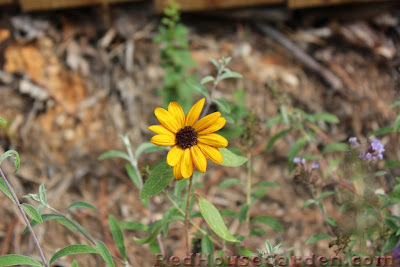 I wasn't really expecting that you would bloom this year... you arrived at the garden so late in the year. You guys are still blooming?!! 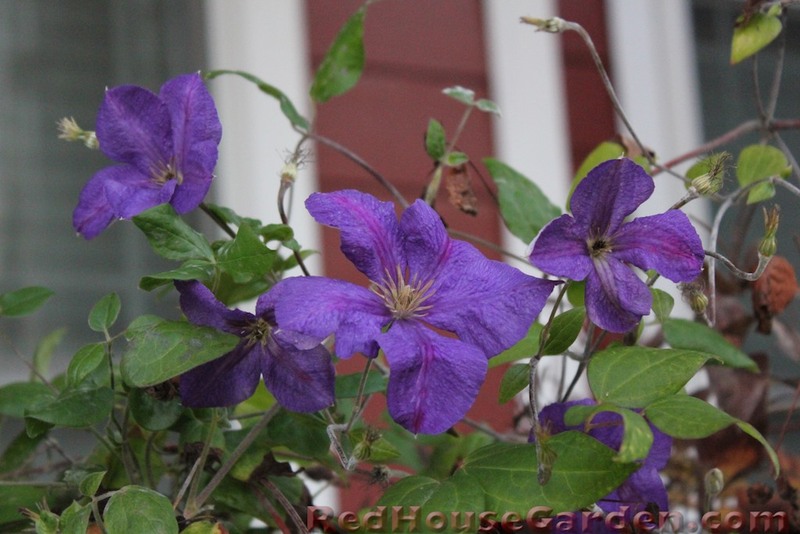 Bill MacKenzie Clematis and Jackmanii Clematis, at your service! Jackmanii, you're still in bloom?! How many months have you been going?! 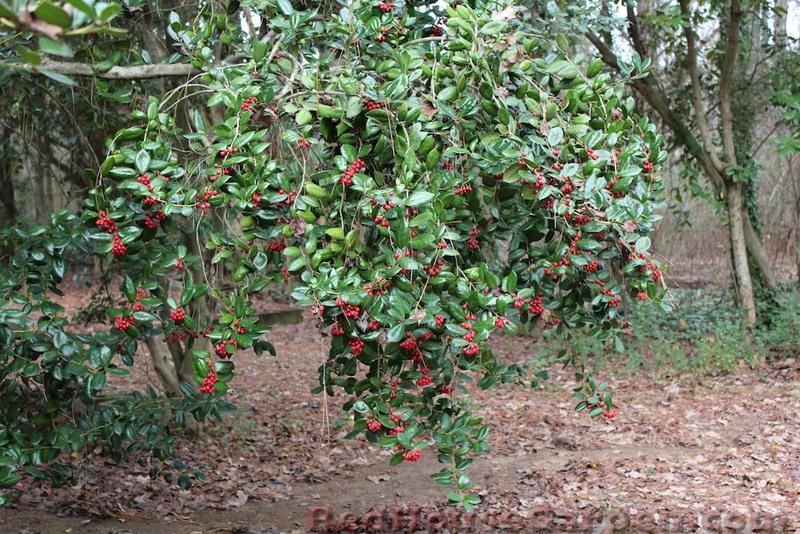 And how in the world do you still have more buds when all your leaves have been dying off for the winter? Oh well, sacrifices have to be made. Why use up energy to maintain leaves when you can spend it on blooms? Ignore those leaves and focus on the pretty flowers! Hey, do you think you guys could bloom until late February or March when my spring blooming clematis take over? Then I could have clematis blooms year round! Uh, don't push your luck. Sorry. I was getting excited. And sorry, garden, for neglecting you quite a lot lately. After the holidays, I promise! Who would have guessed there would be so many blooms among the brown of winter? It has been so long! You simply must come visit. When you come, I'll take you to the Red House Garden, a lovely place and a regular stop on my daily schedule. 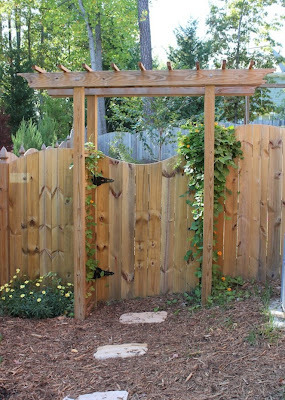 Every morning around dawn, I slip through the gap in the backyard gate and enjoy the view of breakfast from the corner of the yard. 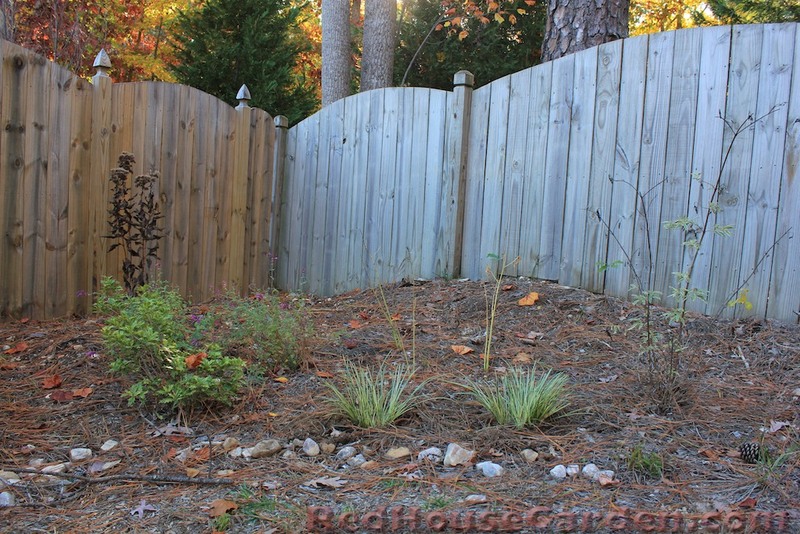 According to Mrs. Red House, the corner of the yard is supposed to hold a butterfly garden, but the plants look rather neglected way over here. 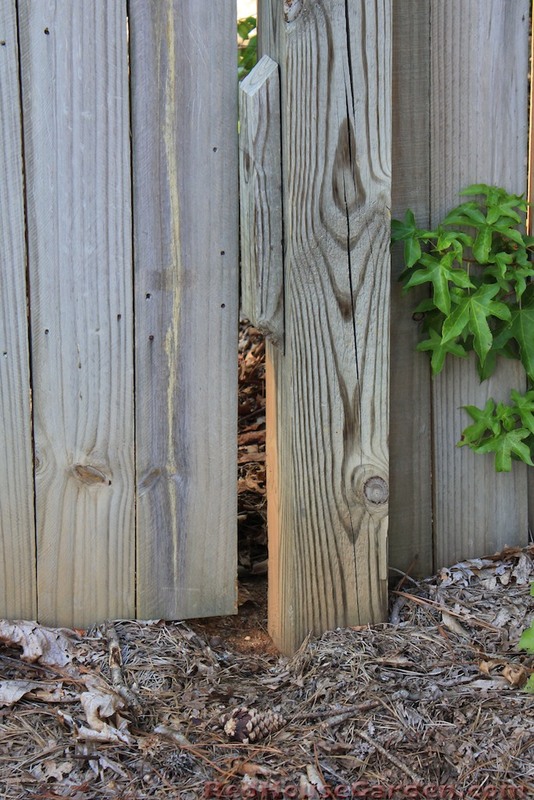 So in order to help her out, I do my morning business here, me being such a considerate rabbit and all. 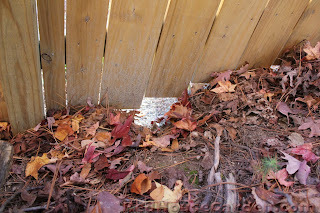 Everyone knows that rabbit droppings are wonderful fertilizer, so I make sure to leave a nice large pile every morning. 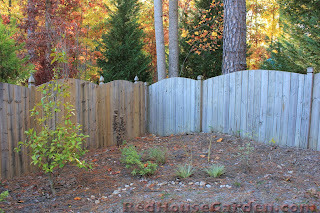 Occasionally I hear Mrs. Red House complaining loudly about stepping around piles while trying to garden, but I know she must be kidding. By the state of things, it's pretty obvious that she doesn't garden much over there. After doing my good deed for the morning, I am usually hungry. Thankfully the Red House Garden offers a wide variety of morning delicacies - coneflower leaves, mums, some of your favorites! 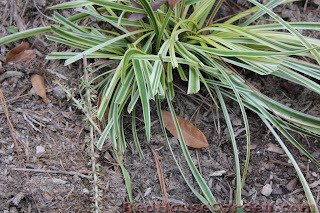 You must try the variegated liriope. Ah, Cousin Peter, I have found the most delicious plant in the garden! 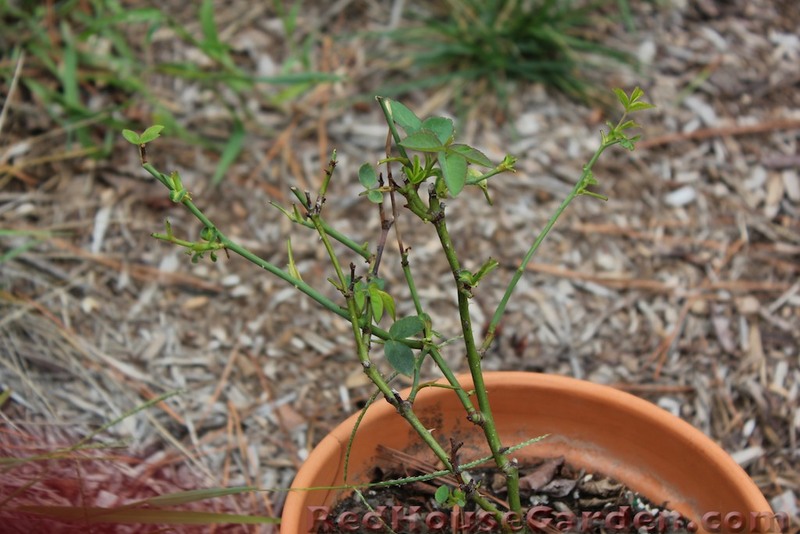 Sweet, succulent Rose leaves. A nice, tender Bourbon rose, if I am a proper rabbit judge of such things. This one tastes Expensive. I was right - Expensive was among the words Mrs. Red House used when she found it afterwards. There were some other words as well that I don't think were quite so acceptable for polite rabbit company. She must have forgotten just how much I help her out each day with my abundant piles. Mrs. Red House has only actually seen me once, as I usually stay in the woods on the other side of the fence. She ran after me with a camera wanting to take my picture, probably in appreciation, but I am too shy and humble for that. 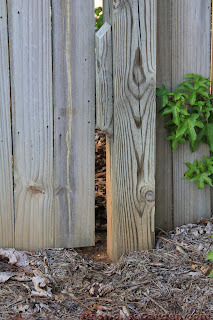 I managed to squeeze my large self out through the gap in the gate in a hurry. Which reminds me, when you come please don't wear one of your ridiculous jackets with the big buttons that get caught on everything! 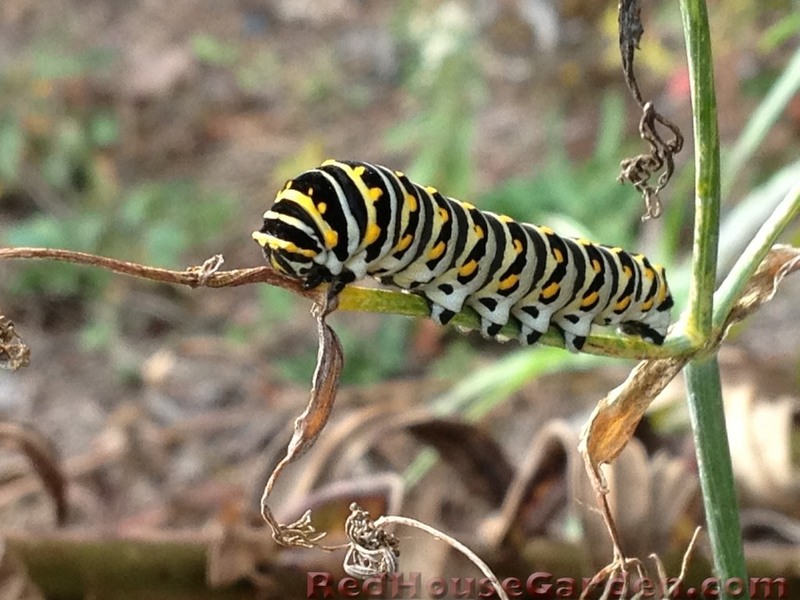 One day soon afterwards, I came to the garden as normal and found that Mrs. Red House had decided to block up my normal access route. There must have been some less helpful rabbits helping themselves to the garden buffet. Freeloaders! Thankfully I have another secret route that I can take you through. Stop by sometime, and I'll show you around! Hope you all are doing well, and give my love to Cousins Flopsy, Mopsy, and Cottontail! 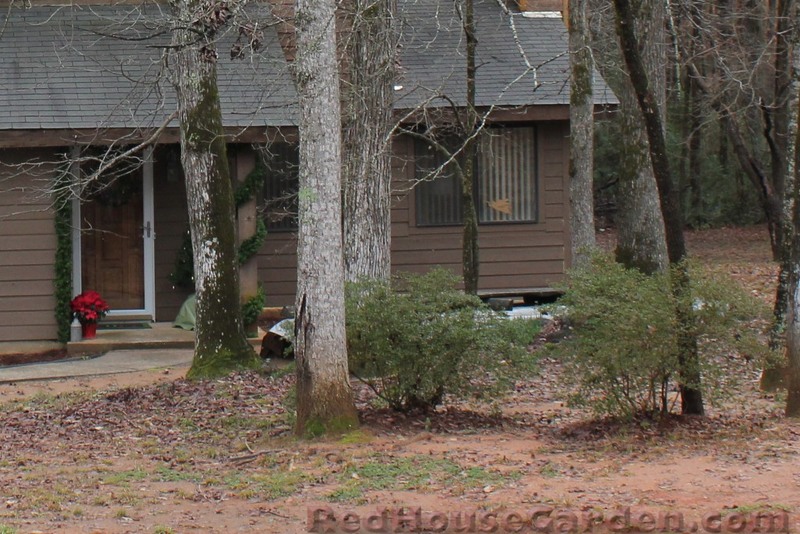 For my birthday, the wonderful Mr. Red House got me a telephoto lens for my camera. 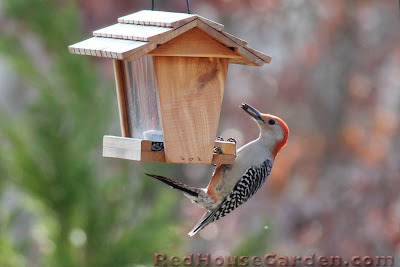 I took it out for a test run and had so much fun getting close-up pictures of the birds. This guy is a frequent visitor of the Red House Garden. 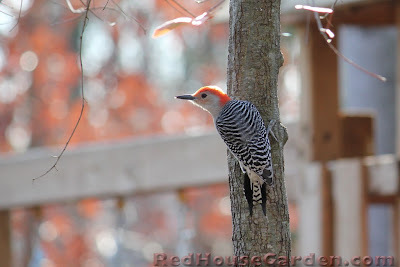 He first came to my attention when I pulled open the blinds in an upstairs room only to look into the startled eyes of the woodpecker on the other side. He was perched on the edge of the roof holding a large seed in his beak. I don't know who was more surprised, me or him! He stared at me for a long second, apparently decided I was harmless, and then went about tucking the seed under the eave of the roof. Here you can see red patch on the belly for which the Red-bellied Woodpecker is named. I've seen him up on the edge of the roof several more times, sometimes peering at me over the edge of the gutter. 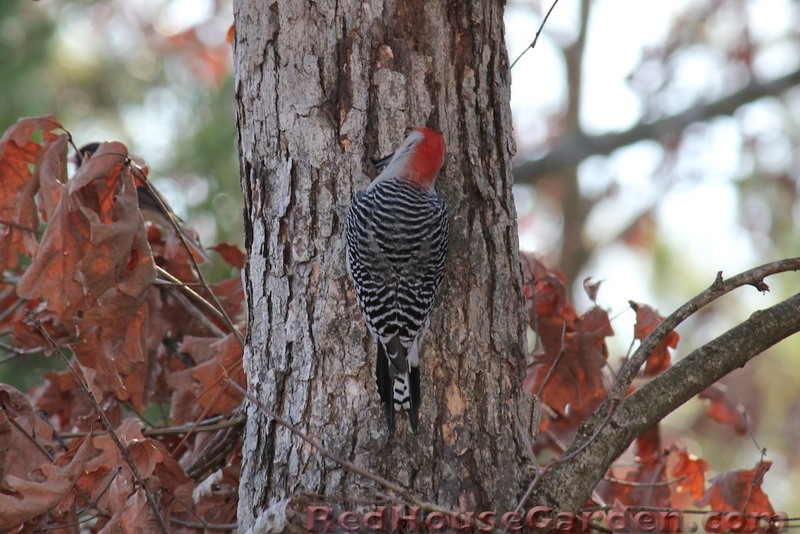 Red-bellied Woodpeckers will store food in the crevices of tree bark or fence posts for later. They obviously sometimes store food under roof eaves as well! Some other photogenic and common visitors to my bird feeder are Tufted Titmice, Dark-eyed Juncos, and Carolina Chickadees. 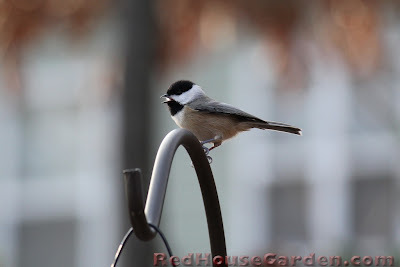 With the telephoto lens, I could sit on the other side of the yard and still get close-up pictures of the birds at the bird feeder. 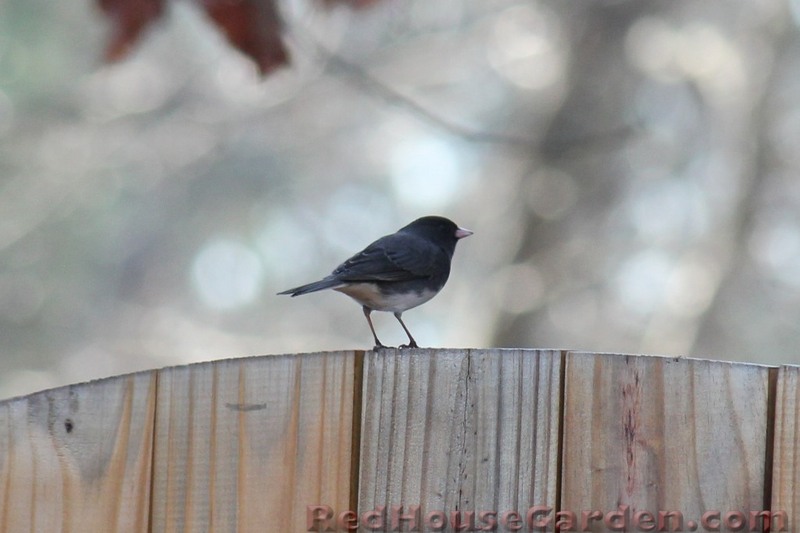 There were one or two shy birds who still looked over at me and checked me out before getting seeds, but most ignored me, as I was so far away. 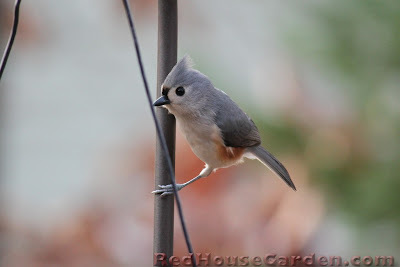 This will also be a big help in identifying the various species that come to my garden, which has been a challenge for me with all the different birds. I'm definitely going to enjoy this lens! The leaves have almost all fallen, and I have been busy planting bulbs, cleaning up the garden, and collecting seeds to save for next year. 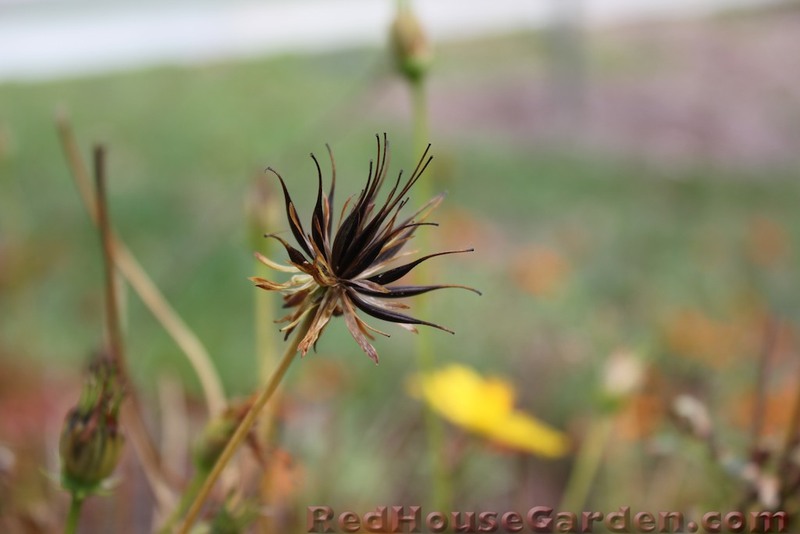 There could be hundreds of seeds in this rudbeckia seed head. 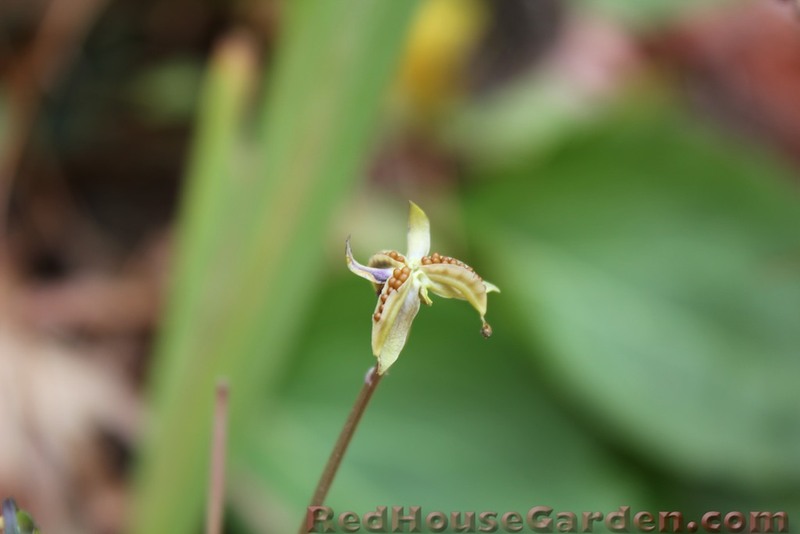 For many plants in the garden I am just letting nature take its course and letting them self-sow. I wonder what plants will spring up where next year? I marvel at the ways nature has adapted to spread seeds. Some seeds such as dandelions and Joe Pye Weed ride the wind on their little fluffy parasols. 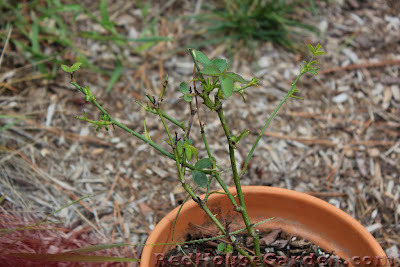 Impatiens have exploding seed pods that will fling the seeds several feet away. The hairy pods of Tick Trefoil, a wildflower/weed that occasionally graces my garden, will latch onto any animal or garden glove that brushes against it. There are also, of course, the seeds that travel long distances in the bellies of fruit-eating birds and then come out the other end. I shall spare you pictures of that one. 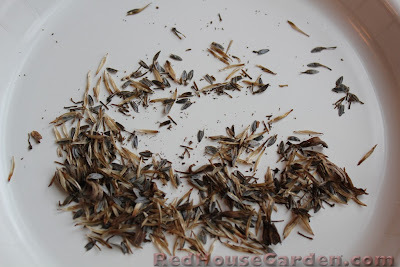 Some seeds in my garden I chose to collect and save to plant again next year, especially those of annuals. 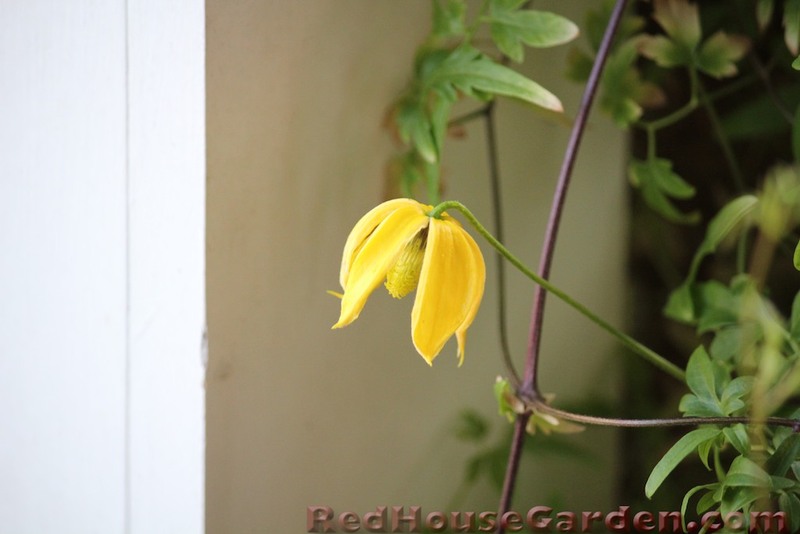 My easiest seeds to gather were those of the cheerful yellow Cosmos sulphureus. These Cosmos were ones I had grown from seed that I had saved the previous year. And the cycle continues. 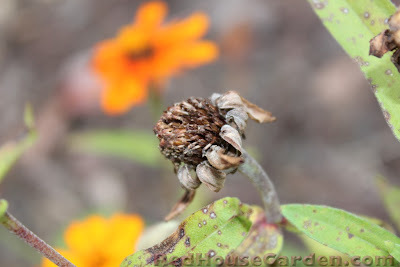 For seeds that grow on seed heads, like my orange Zinnias, I cut the seed heads off once they turned totally brown. I then pulled the dried seed heads apart, separated the seeds from the chaff, and stored them in a cool, dry, dark place for next year. 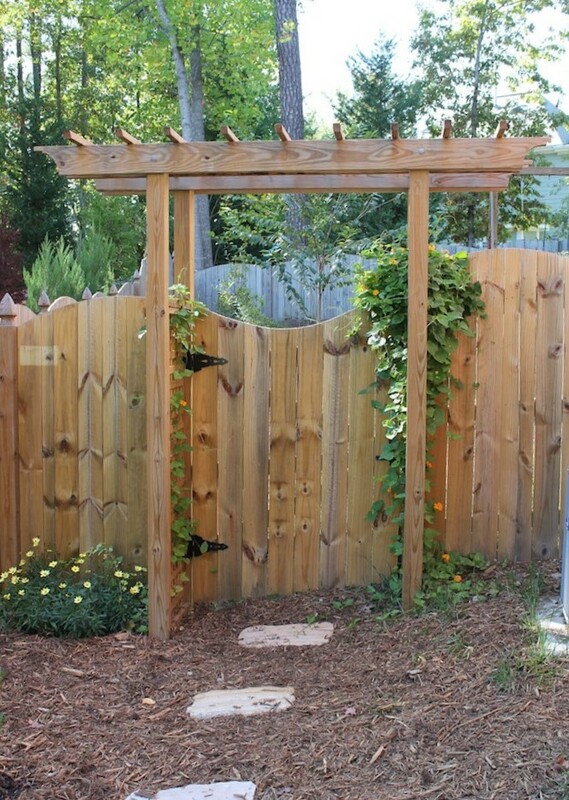 Each plant produces so many seeds that there is more than enough to store and share with friends and neighbors. Even after harvesting the seeds that I want, there are many seed heads left. In the backyard I leave them on the plant for the birds, and in the front I cut them off during my tidying up for the winter and set them out for the birds to enjoy. Next year's garden shall be composed partially from the seeds that I have saved this year. Plants for free? It doesn't get better than that! 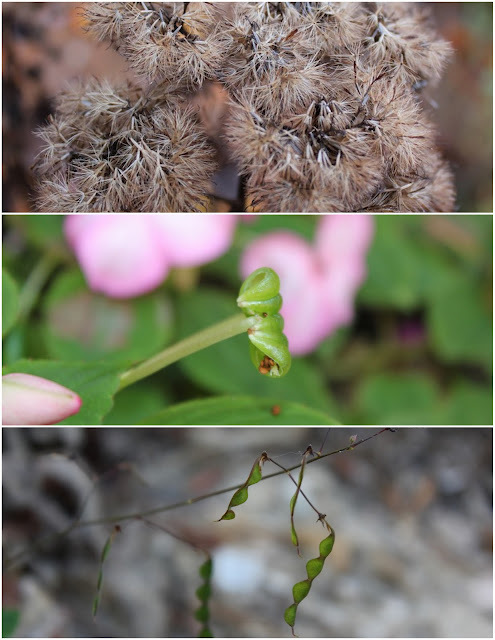 In the middle of November, I was taking a walk through the gardens of a nearby community center. 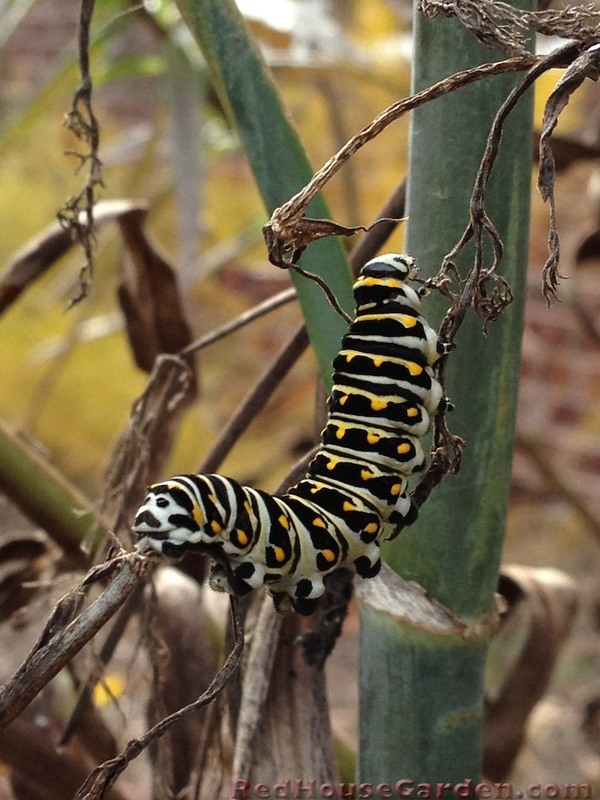 They have a small butterfly garden, and I was stunned to count seven black swallowtail caterpillars on one plant. We had already had our first frost, but temperatures had then shot back up into the 70's - a typical North Carolina weather fluctuation. The caterpillars were all eating as fast as they could, which was smart, as cold temperatures were again rapidly approaching. Indeed, a few days later the weather turned cold again. 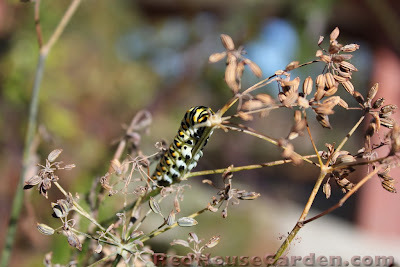 I went back to see how the caterpillars fared and found two left sunning themselves on the plant. They were not moving at all in the chilly morning air. 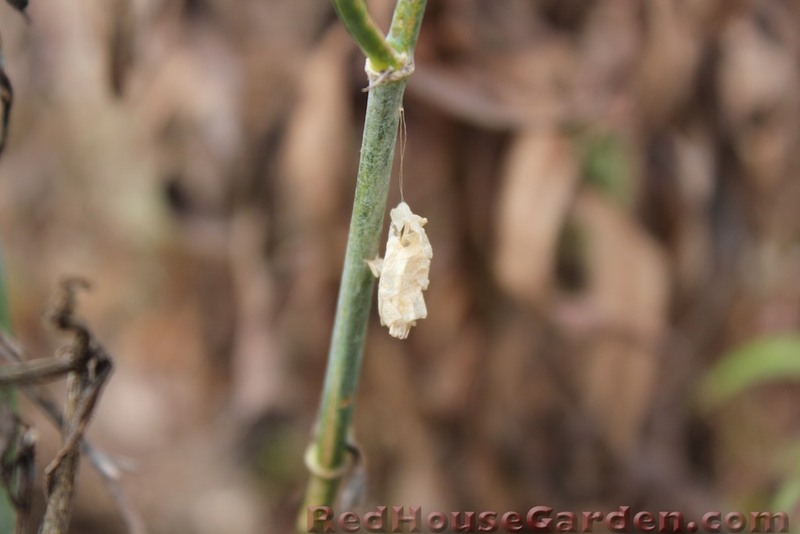 I hoped that they were contemplating making a cocoon as time was running out - temperatures were about to dip below freezing for a couple nights in a row. Black swallowtails survive the winter in their pupal stage, hibernating in their chrysalis (cocoon). 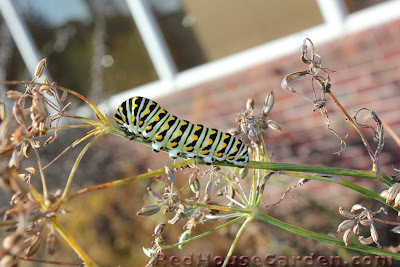 I went back a few days later to see if I could spot any signs of the caterpillars. 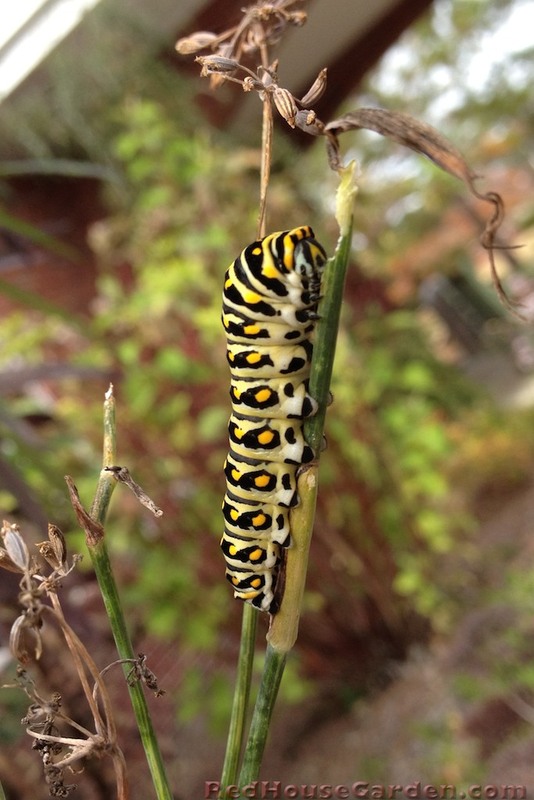 All I could find was an empty chrysalis. It was probably from an earlier caterpillar, as it takes around 10 days for a caterpillar to transform into a butterfly and it had not been that long yet. I could not find any other cocoons, but they are meant to be hard to find! I hope that the caterpillars are all curled up and deep in sleep somewhere for the winter, waiting for they day they can emerge in spring as beautiful black swallowtail butterflies. And hopefully some will come visit! Now that the growing season is pretty much over at the Red House Garden, I'm looking back and taking stock of some things I could have done better this past year. 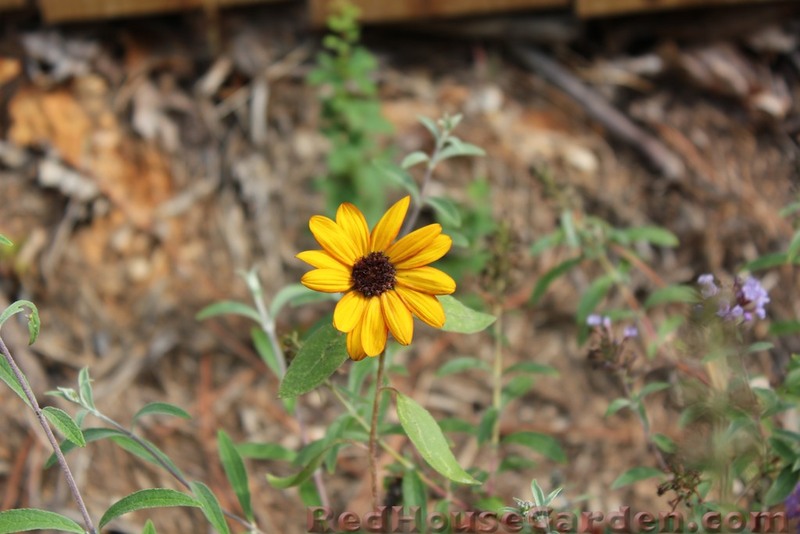 This is a sunflower that grew from a seed I planted. It is quite pretty up close, but there is a problem. 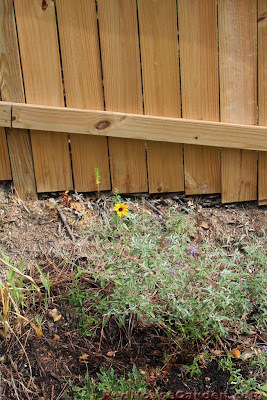 It was supposed to have been a 10 foot tall mammoth sunflower. My preparation of this site was obviously lacking. Yeah, that didn't turn out so well. These are tomato plants that I started indoors from seed early last spring. By summer, my tomato plants were just leggy, scraggly looking things. This area was much shadier than I had previously thought, and the effects show. 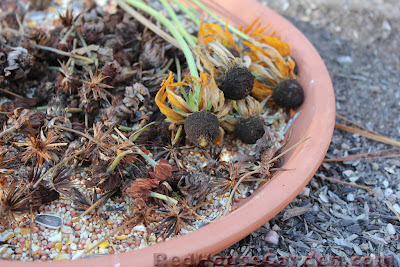 I think that my dirt was not quite rich enough as well (see mistake #1). 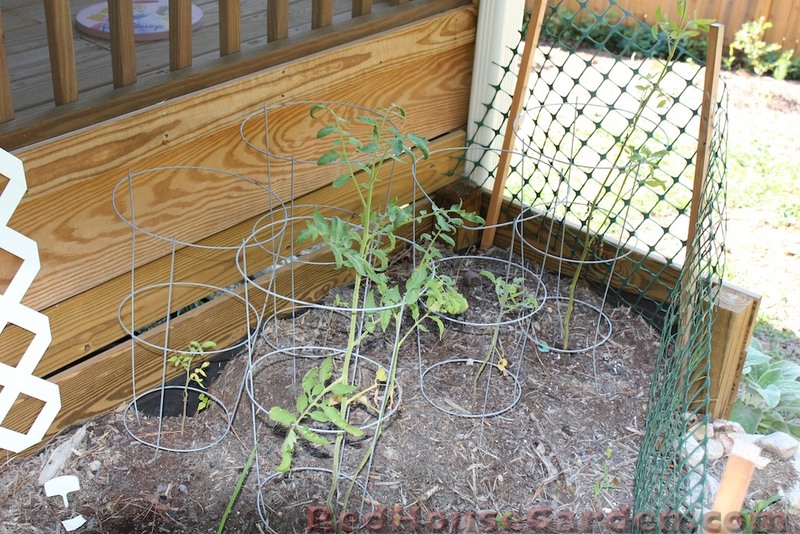 I had given some of my tomato seedlings to my neighbor who had them on her deck in full sun, and when visiting one summer day I was blown away with her giant productive tomato plants! I thought she had bought some seedlings from a nursery, as her plants looked so different from mine. One could also rephrase this as 'use your brain and actually think before you plant'! I don't know if I get caught up in the joy of planting or what, but I have had several issues with measurement. I misjudge how big something is going to get and before I know it I have a plant that has eaten half of my porch (yeah, I'm talking about you, 'Bill Mackenzie' Clematis)! 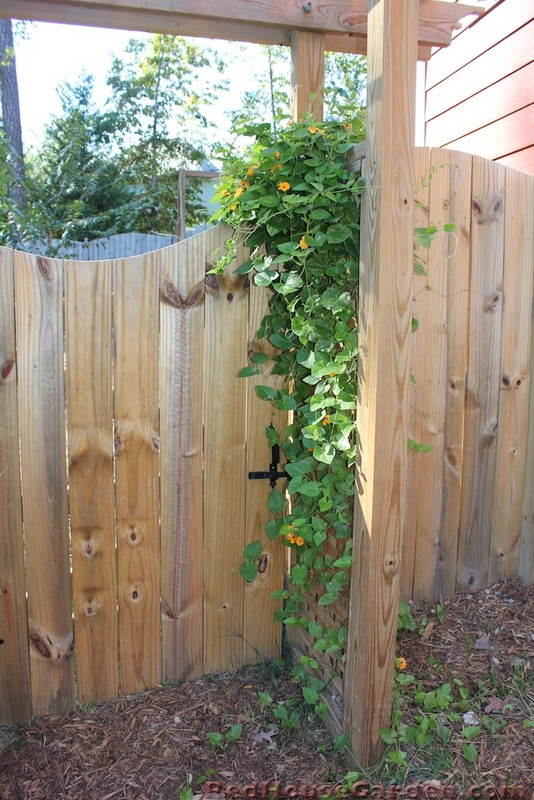 Accordingly, the most embarrassing gardening mistake I have made this year has to do with the thoughtless planting of black-eyed susan vine, Thunbergia alata. 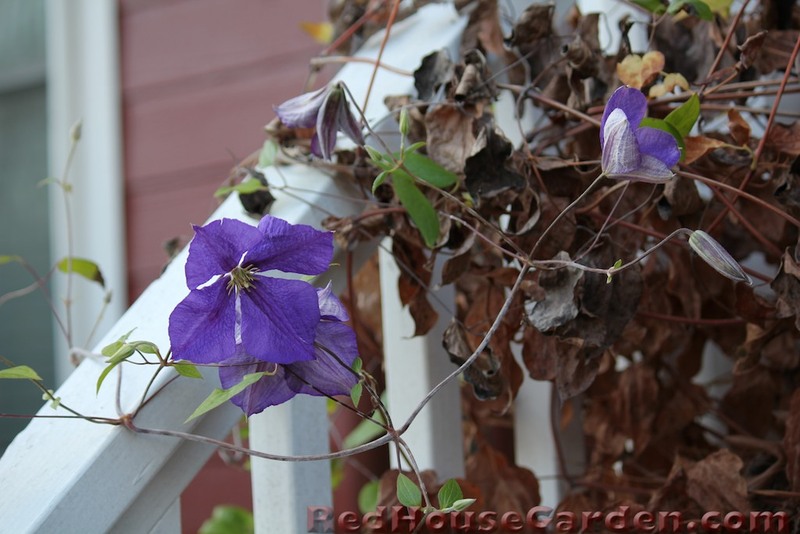 I love this vine, it's easy to grow from seed, and I thought it would look lovely climbing up the sides of my brand new arbor. I was correct on all counts. But there was one little detail I forgot about. Can you see what the problem is in this picture? Look a little more closely. Yes, folks, that is the door handle for the gate in my arbor, and yes, it swings out, past the trellis. 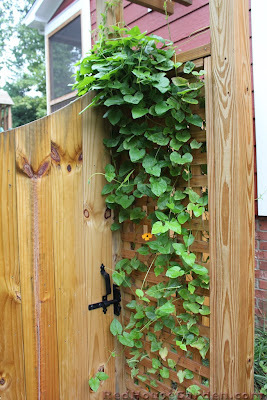 And yes, you guessed it, I was unable to open my gate all summer for fear of ruining the vine. 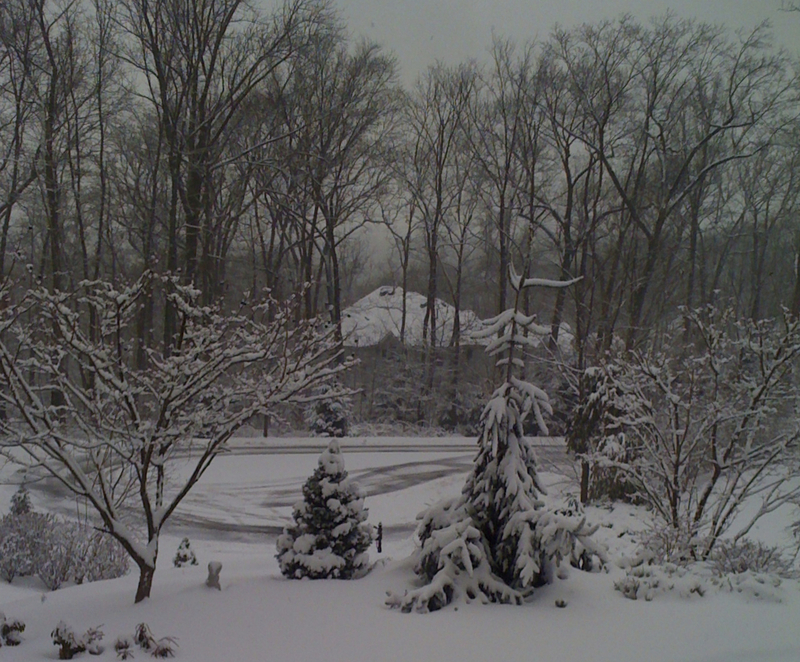 But it was pretty, and thankfully it's an annual. I can try again next year. You can check out PlantPostings' site to see what lessons other gardeners around the globe have learned this year!